Why Ask for Mid-semester Feedback from your Students? Gain specific and formative feedback intended just for you, which is different from summative end-of-semester Student Perceptions of Teaching forms that go to chairs and deans. What aspects of the course are helping you to learn? What aspects of the course might be tweaked to help you learn even better? What are the two most important things you’ve learned so far this semester? What don’t you think you understand well enough? When were you most engaged this semester? Alternatively, Boston University’s Center for Teaching and Learning describes a quick, simple, method for gathering feedback: Ask students to write down one thing they would like you to stop doing, one thing they’d like you to continue doing, and one thing they’d like you to start doing. What are you doing to help your learning in this course? Are you hindering your learning in any ways? What could you be doing to improve your learning in this course? Scott Windham’s form asks a blend of multiple choice and open-ended questions. Although his questions focus on his specific course content, objectives, and methods, they are easily adaptable to your own. Want to see the questions that Srikant Vallabhajosula asks? What about questions asked by Janet Myers and Rosemary Haskell? In addition to evaluating the instructor’s methods and materials, some faculty ask students to evaluate their own class participation (using a rubric) at the same time as they ask for feedback on the course. Need more ideas? See the resources below. Ask questions that focus on learning, not what students like or dislike. Whatever format you use (on-line or on paper), preserve students’ anonymity (so students don’t fear repercussions from being honest). 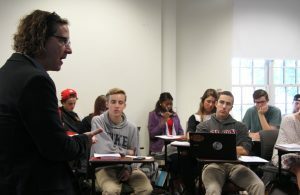 Clarify your intent – for most faculty, it’s not possible to enact a fundamental course design in the middle of the semester, so ask students for constructive suggestions for ways you might make incremental changes. Consider carefully when numerous students express the same concern or suggestion. You may not be willing or able to do exactly what they suggest, but there may be other ways you might address their root concern. Share what you heard (the trends) in a way you can do so comfortably and non-defensively (e.g. short comments in class, written in an email, etc.). 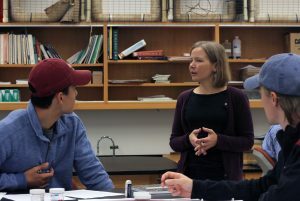 Biology professor Jen Hamel creates 4 tables, each on a different Power Point slide, which categorize their responses to the 4 questions she asked. She reports how many students made each comment and lists them in order of frequency of being mentioned. Let students know what you’re going to change due to their feedback. Briefly explain why you can’t/won’t make other frequently mentioned changes (and what things you will consider for future iterations of the course). Highlight what students said is working. If needed, clarify the rationale for teaching strategies, course goals, or misunderstandings about aspects of the course, or explain why some suggestions were unrealistic or not pedagogically sound (be careful about being non-defensive). Thank them for their honest and constructive feedback. You’re not alone! If you’d like some help as you analyze the feedback or consider how to respond to it, make an appointment with CATL. In addition, CATL offers a service sometimes called Midterm Student Focus Groups or Small Group Instructional Diagnosis (SGID). Research on this technique demonstrates that it typically leads to more student learning and greater student satisfaction. It involves setting aside about 20 minutes of class time to allow a consultant to gather written feedback and to talk with students after you step out of the room. During a follow-up consultation, the consultant will analyze the feedback with you, discussing how you might respond to the range of student comments generated by the focus groups. Email CATL@elon.edu to inquire if it’s possible to schedule one. The UNC-Charlotte Center for Teaching and Learning and the University of Texas at Austin Faculty Innovation Center offer wise advice. Miriam Rosalyn Diamond, “The usefulness of structured mid-term feedback as a catalyst for change in higher education classes,” Active Learning in Higher Education 5, no. 3 (2004): 217-231. Carol A. Hurney, Nancy L. Harris, Samantha C. Bates Prins, & S. E. Kruck, “The Impact of a Learner-Centered, Mid-Semester Course Evaluation on Students,” Journal of Faculty Development 28, No. 3 (September 2014). Margaret K. Snooks, Sue E. Neeley, and Lee Revere, “Midterm student feedback: Results of a pilot study,” Journal on Excellence in College Teaching 18, no. 3 (2007): 55-73.